It”s been raining for the past week and when the same came out, I took the opportunity to wear one of my few floral pieces. I’m not girly enough to wear floral often but I gravitate towards darker floral pieces because it’s easier to wear throughout the year. 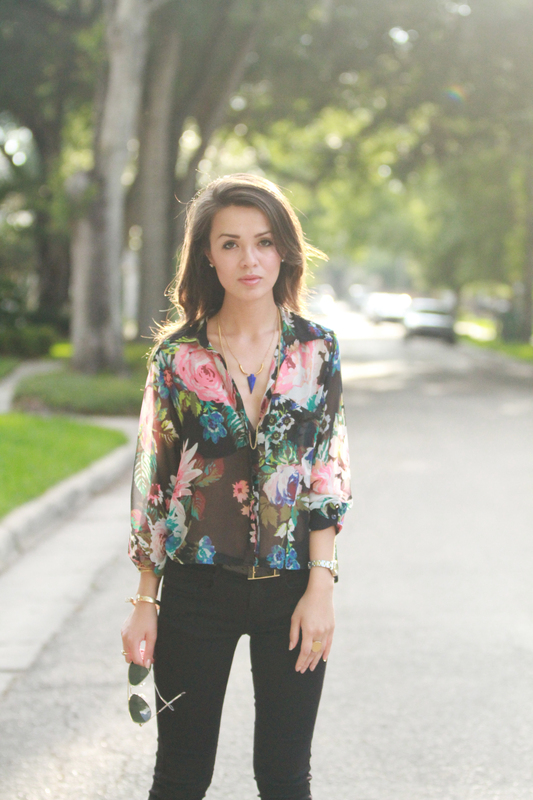 I toned down the floral shirt by pairing it with black skinnies and my favorite go to sandals. However, my favorite part of this outfit, is this lapis blue arrowhead necklace by Lisa Kerns Jewelry. It is absolutely stunning and I love the ethnic influenced design. I adore the simplicity of the necklace but the statement the lapis blue stone makes. It can also be easily worn by itself or layered (I wore it both ways). You could probably say I’m obsessed with is, because ever since it arrived on my doorstep, I’ve been wearing it with everything from a little black dress to a simple white tee and jeans. It comes in either silver or gold and is the perfect piece for those hot summer days when it’s just too hot to pile on heavy accessories. It’s definitely a must have for any type of wardrobe. you (and my necklace) look phenom; thanks for the love girl! This is so lovely Hanh. You’re right, the necklace is so beautiful. You can definitely dress it up or go casual with just a tee/ jeans and still this necklace will make the different. Love it! Beautiful dark floral blouse. You have some amazing outfits posts!!! Love your style and looking forward to seeing more!